Declaring that “it takes a village to build a village” Department of Housing and Urban Development Secretary Shaun L.S. Donovan thanked Metro, the City of Los Angeles, the State of California, developers and nine financing partners for the successful completion and occupancy of 92 apartment units of the Joint Development Program at Westlake/MacArthur Park during a tour of the project today. The transit oriented development is part of a public/private partnership built near the Metro Westlake/MacArthur Park subway station and is designed to reduce auto use and increase transit ridership. All residents receive free Metro transit passes as a benefit. More than 1,000 families applied for 92 apartments, which are designated as “affordable,” and were fully rented by the time the development opened in May, 2012. “We are celebrating this model that the rest of the country should be looking to,” Donovan said. “Putting housing close to transit is part of President Barack Obama’s Climate Action Plan,” he said. Phase two, which is scheduled to begin construction in December, includes an additional 84 affordable apartments as well as retail and commercial space to enhance overall land use and economic development. “These apartments will be affordable for not only the first family that moves in but also for future generations as well,” Donovan said. Metro owns the land and private developers build the housing development at their own expense. The projects provide Metro with ground lease and retail sales percentage revenue based on the fair market value of Metro’s property. These amounts, in turn, are reinvested in eligible transportation projects throughout Los Angeles County. In many cases, the developments also include new and upgraded transit facilities that further benefit Metro and its patrons. Metro has already completed eleven other joint development projects, three similar apartment complexes are under construction and Metro is in negotiation on nine other prospective developments. 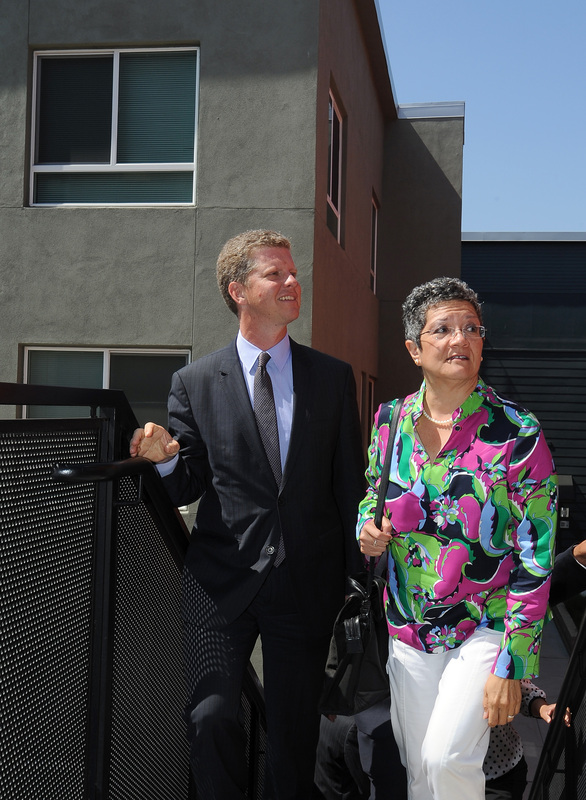 Housing secretary Shaun Donovan tour’s Metro’s transit oriented development near MacArthur Park. Metro’s Chief of Real Estate Roger Moliere (left) with Housing Secretary Shaun Donovan on a tour of of Metro’s transit oriented development near MacArthur Park. 1000 families applying for 92 open spaces? Clearly that shows housing demand still is high but LA isn’t building multifamily complexes fast enough to keep up with demand. FYI, for your caption, walking with Secretary Donovan in the first pic is Mercedes Márquez, General Manager of the City of LA’s Housing & Community Investment Dept.